Today, Thursday December 5, 2013, the ABMI released the report: The Status of Biodiversity in the Athabasca Oil Sands Area. This report contains the first ever comprehensive analysis on the status of Alberta’s species in the Athabasca Oil Sands Area (AOSA). With a range of intensive activities occurring on the AOSA land base – from forestry to energy extraction to municipal expansion – there’s a clear need to understand and manage the cumulative effects of these activities. The ABMI report supports both of these objectives. For the first time ever, the ABMI presents data on the status of over 350 species (plants and animals) in the AOSA. Using the Biodiversity Intactness Index, which is a measure of how much more or less common a species is relative to an undisturbed landscape, biodiversity intactness in the AOSA is currently 94%. The report evaluates two additional sub-regions – the Active In-situ Region and the Surface Mineable Region – and found biodiversity intactness to be 91% and 86%, respectively. The report also highlights species that show the most sensitivity to human development. For example, species that prefer old forest habitat, like the Pine Marten, Fisher, and Bay Breasted Warbler are less abundant than would be expected in an undisturbed area. In contrast, species that thrive in areas with human development, such as the coyote and song sparrow, have higher abundance than would be expected in an undisturbed area. Using the ABMI’s wall-to-wall provincial inventory on human footprint, the report describes the current extent of visible human footprint in the AOSA. As of 2010, 6.8% of the region showed visible evidence of human footprint, with forest harvesting accounting for the largest human footprint at 3.1%. With respect to the Surface Mineable Region, human footprint measures at 20.8%, of which energy infrastructure was the largest component at 16.8%. 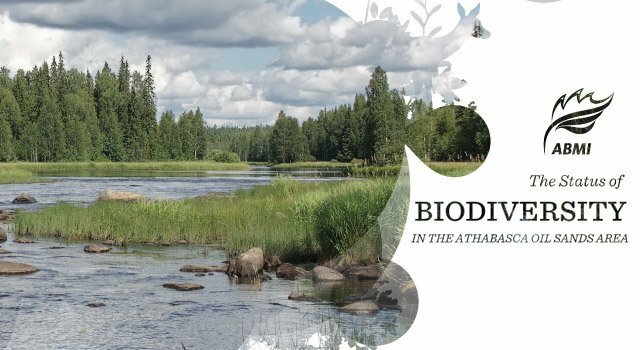 Read the report “The Status of Biodiversity in the Athabasca Oil Sands Area” [here]. Please return to the “It’s Our Nature to Know” blog for more extensive coverage on the AOSA report soon.